Bassano del Grappa Dances Out! Starting from dance to open a discussion, involving the public, around the theme of the body, whatever it is. 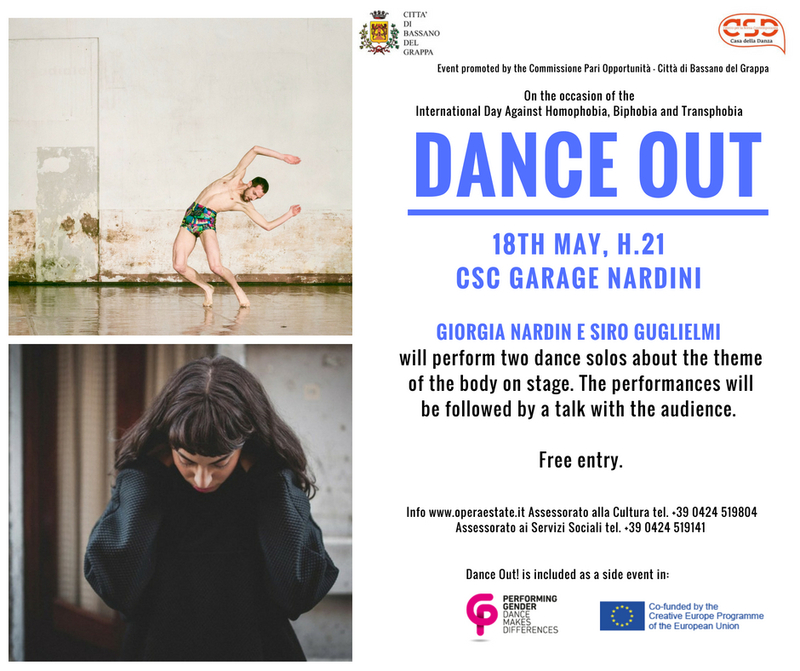 This is the focus of DANCE OUT, the project promoted by the City of Bassano del Grappa. The evening is promoted by the Equal Opportunities Commission of the City of Bassano del Grappa, in collaboration with the Department of Culture and the Social Services, for the occasion of the International Day against homophobia, biphobia and transphobia. The event is part of the side activities of Performing Gender - Dance Makes Differences project. During Friday 18th May evening the audience will attend two different performance. The first, p! nk elephant by Siro Guglielmi, is the search for expression of a body in continuous desire for transformation. On stage a light and spontaneous dance that promotes the desire for physical change, without relying on gender and gender distinctions, trying to go beyond a rigidly dualistic world view, in an attempt to bring the viewer to reflect on the role of social expectations about the body. The second work on stage will be Tatik by Giorgia Nardin, a sketch, a canvas of notes, through which the artist reflects on his queer, mixed and diasporic body, on the ways in which the Western gaze helped to forge, colonize and confuse it. The work stems from the conversations between Giorgia and Kamee Abrahamian, a queer artist of Armenian origin. After the two solos the artists will conduct a moment of reflection and discussion with the public.